Our suite is only a mile from the middle of downtown. Many people just drive and park for the day or evening in a parking garage for $5 to $10 and walk all around. Also some take a taxi for a few bucks and do the same. You can walk to downtown from the suite. We have just repainted, changed out curtains, linens and dishware. Spacious 600 square feet eclectic grand suite including Jacuzzi and separate custom Zen shower for two,candles, live plants, natural soap and a heated tile floor included for you to wind down after a great day sightseeing, hiking or enjoying downtown Asheville. King size bed with dreamy Bamboo sheets. Lots of pillows for a comfortable, laid-back experience! The entire suite is decorated with local art, books, plants and unique furnishings. Several board games are available as well. There is a 52 inch TV with DVD can be turned towards the bed or elsewhere in the room. Some movies are provided, we have full cable and a personal computer in the home and very high speed WIFI. An electric fireplace keeps you toasty while you read by the window. Kitchenette includes microwave, toaster oven, stove top 2 burners with pots and pans, blender, crock pot, fridge stocked with a complimentary bottle of wine from the Biltmore Estate or local 6 pack of beer. Asheville has been named 'Beer City USA' and we stock your soon to be favorite micro brews, also complementary. Start or end your day with the provided hot coffee or tea. Huge walk-in closet for all your clothes and gifts. Includes a hair dryer, iron and ironing board. A double bed can also be provided for parties of 3 or 4 guests.There is also a baby crib/playpen with all the cozy bedding included if needed. Private garden with outdoor table for four and access to two acres of other on-property gardens paths as well. Also, feel free to walk around the quiet neighborhood with views of a large pond, nature and mountain scenery on a circular road. We are available and live at the property and or avail. by phone if any assistance is needed. We run and own a raw vegan chocolate business on-site with it in the Whole Foods and other natural stores. Free selection of our gourmet chocolate is included! VRBO #469612 with 2 bedrooms and a kitchenette. These both can be rented together for a discount. I am a 4th generation native of Asheville. After raising 6 children here, I decided that it was time let others enjoy the lovely space that I carefully renovated to be an inviting presence. I live and work on the property as I am an RN and a raw vegan chef and have a raw vegan food business to assist others in having foods to heal their body, mind and spirit. Quiet and beautiful home two acres of gardens located only minutes from downtown Asheville. This is a safe quiet neighborhood with a great circular street for dog or people walking. Enjoy some delicious, healthy, raw vegan chocolate, if you would like. We live on site to assist with any all of your needs and I own a home care business to provide further cleaning, transportation, pet, baby or elderly sitting. Electric can be used for warmth or without heat to add ambiance to the room. coffee maker with cream and gourmet coffee and tea included. many great books are available. We have about some movies and red box for rental is about 1/4 mile away and well as cable. Private Garden and also access to 2 acres of other gardens as well. level area from parking to room door, step in shower for 2 with a handheld shower. Two person Jacuzzi with bubbler and powerful jets. Healing Himalayan sea salts provide a relaxing experience. Could’ve gotten more towels. Had an issue with the batteries in the remote and it was taken care of quickly. Over all it was nice. Glad you enjoyed your stay. I wish I had known that you needed more towels as we live at the property and could have brought them over immediately. Come back anytime! great location, comfortable but not perfect. First off, let me say the king-sized bed was super comfortable! The room was a good size and wasn't crowded with the two of us and our three dogs. It was a short drive from the property to downtown Asheville, and popular tourist attractions such as Biltmore Estates. It was quite day and night, and there was a generous, two level fenced yard for the dogs to run and play. Now, for a few things we would change if we could. The only sink is in the bathroom area, also the only place to prep food is on the bathroom counter. Some of the curtains look more like sheets draped across the windows. And there was no key to the entry door - we were given a small chain and padlock to lock it when we left. It rained one night during our stay, and for the remainder of our stay we had to walk in and out through standing water and red clay mud. As you might imagine, it was difficult to keep the inside clean after that. All in all, if you are OK with some of these "quirks" then you and your pets should enjoy staying here! Glad you enjoyed your stay! So glad we were able to accommodate your 3 dogs. Sorry about the several quirks. We just finished painting and updating the property. The door had to use the unusual lock as it is a custom door and we have to order a whole new set of doors to replace due to swollen door frame from the rain. The curtains are new and we had to replace one of the rods after your visit. The city does not allow a sink to be in the kitchenette of units in the city now which I do not agree with. There are 2 surfaces in the kitchenette area for food prep. We have also added more ground cover and stepping stones due to the 3 times more than normal rains that have been happening. 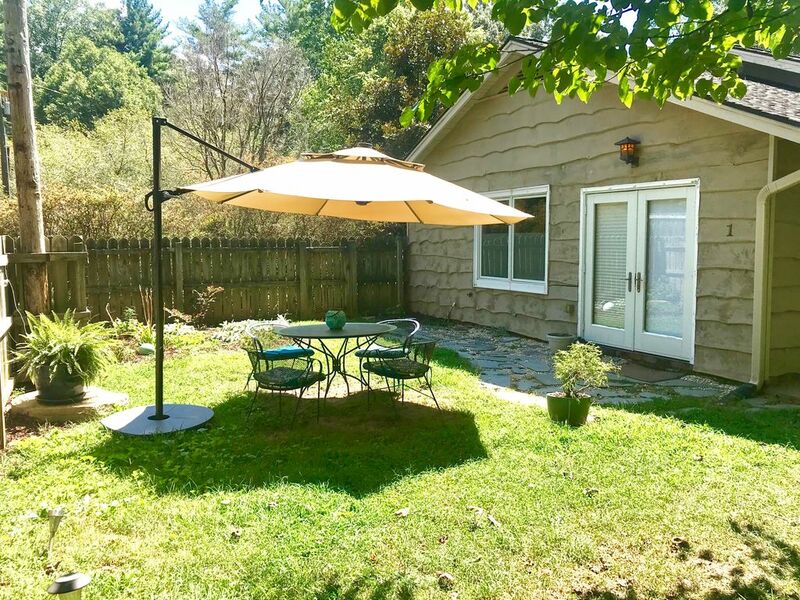 The perfect location if you want to be in Asheville, & also feel secluded in a peaceful location. Very compact kitchen, but had everything you need for simple meals. The heated floor in the bath area was much appreciated. A minor maintenance problem was immediately attended to, and the owner was always available for to answer questions. My chocoholic husband and his chocoholic wife loved the bars that were provided. Just wish we had been young & agile enough to use the jacuzzi tub. We will stay there again if we return to Asheville. What a fun little studio to stay in! We really enjoyed our brief stay at this studio in Asheville. Our hosts were wonderful and very accommodating. Great location, easy car ride or Uber to downtown. Only wish the kitchenette had a sink! We plan on going back soon. The city rules will not let us have a full sink in the kitchenette in the city limits as it is against the rules! Fabulous host, pet-friendly, and I loved everything about the suite! You will love the the small town feel of Asheville with all the amenities of a larger city. It has been called the 'Paris of the South.' We are within 1 mile of downtown with nationally raved about eateries and great music at the Orange Peel and many other venues. We are home to the Moog Fest, Bele Chere, and many other great music and arts festivals. The River Arts district is only a couple of miles away as well with over 50 professional artists working in their studios. The Blue Ridge Parkway has access to numerous hiking trails and the Pisagh National Forest is just a few miles away as well. We usually have specials running for different times of the year, sometimes 25% off the final day, or a free day for longer stays. Please call for current specials!! !